I’ve been trying to figure out xGen for the past week, and I have encountered this issue on several occasions, but I don’t know why it is happening. I’m hoping someone here knows, I’ve been looking around, but I haven’t been able to find any good answer to this. When I want to preview my hair, nothing shows up. I set the curves to guides, and the xGen guides pop up, but the actual hair preview does not. As you can see from the picture I was able to make it work with the first description, but not with my second one. On another note, I am now unable to change the settings of the description that did work initially. I’m thinking I’m making some sort of mistake through my workflow or that it’s the geometry, but I’ve been able to make it work using the same methods on other projects. Hello, its hard to diagnose without more information. 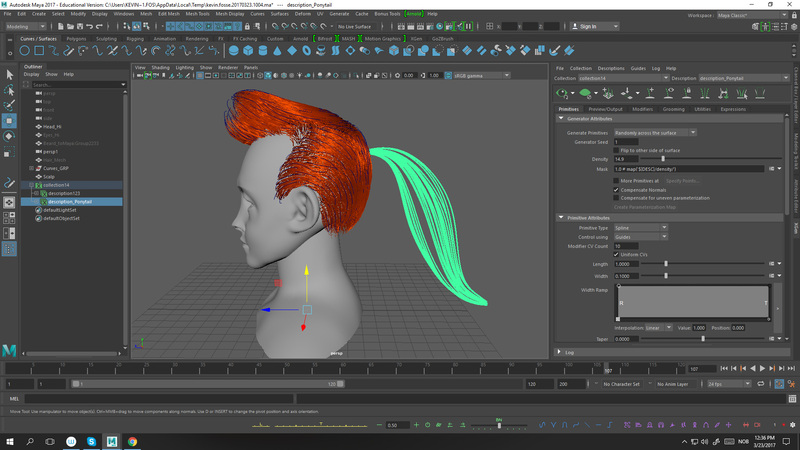 But when I experienced this issue was when working with a large amount of hair density, my memory limited the preview and Maya would not display nor calculate the description. Does the xgen log give any warnings or errors? Set the log levels to 2 or higher and generate a preview. I can’t say I have solved this problem but I did find a way around it. Instead of creating a second description, just duplicate the one you have from the description menu inside of xGen. Now it should be able to show up in the preview, at least it did for me. Did you make sure that the preview was set to all descriptions or Current? Also, check the preview density on the preview/output tab. Does the second description have a shader attached? It wont show up if it does not. Thanks @broddster @Toddski for the input. As you’ve noticed I haven’t been active as it was more an immediate problem at the time. I’ll have a look at your suggestions for future reference. Appreciate your help either way!